"Capital For A Day at Fort Yates, 2000"
Lieutenant Governor Rosemarie Myrdal stands during Governor Ed Schafer's speech at the "Capital For A Day" event at Fort Yates. 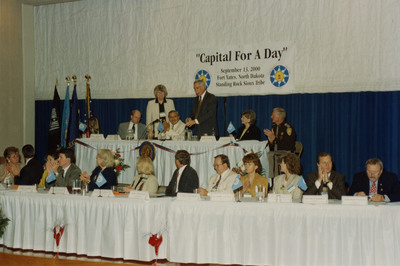 Seated at the top table, from left to right: Bill Goetz, an unidentified man, First Lady Nancy Schafer, and an unidentified member of the North Dakota Highway Patrol. Seated at the front row table from left to right: Tony Clark, Yvonne Smith, Darlene Bartz, Gary Preszler, Tom Freier, Elaine Little, Diane (?) Kevin Cramer, and Bob Martinson.